In many neighborhoods if you asked about the best barbeques in town, they’d tell you, it’s the guy who brings the smoke!! Of course the "reference" is to an actual barbeque smoker. Though smokers are not hard to use, they do require quite a bit more attention. 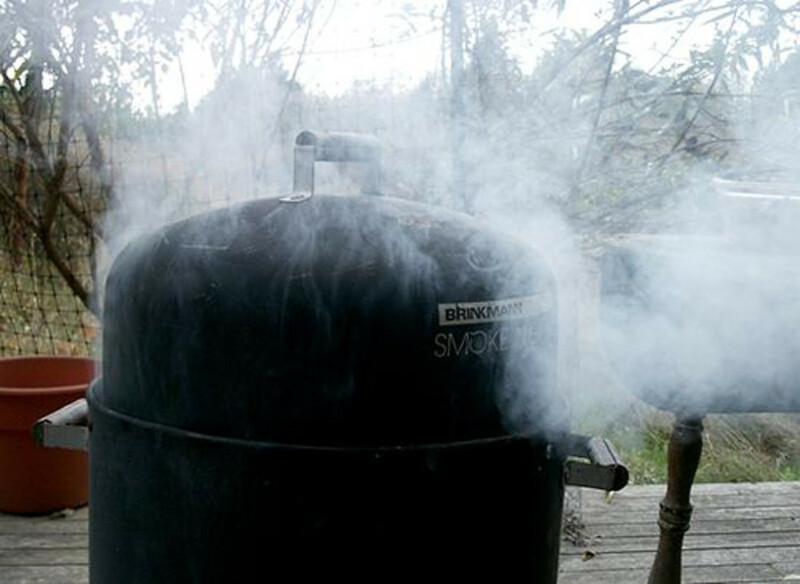 The cooking, or rather the smoking process, is much different than grilling. Smoking requires less heat and a longer cooking time. So grab a libation, turn off your phone, pull up a chair, and let’s get started. What are the Types of Smoke Cooking? Basically, there are two types of smoke cooking; dry smoking and wet smoking. Like any other type of cooking there is always an eternal debate as to which method is best. 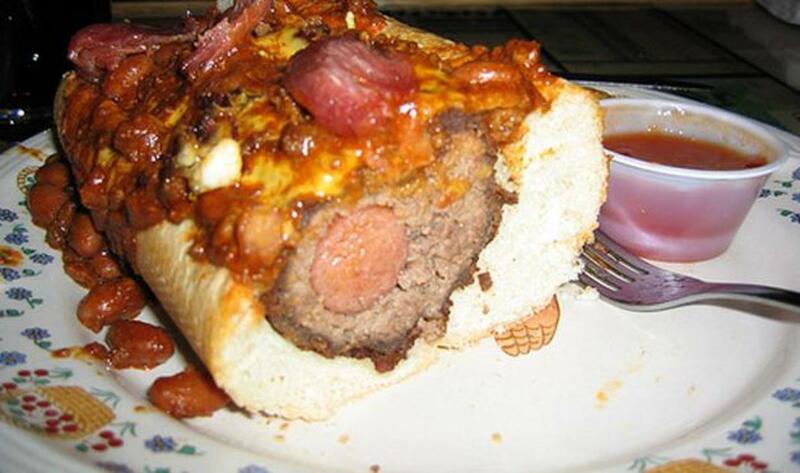 Undoubtedly both produce a deliciously scrumptious end product and can be alternated dependent upon the cut of meat. Wet smokers have “water pans” that create a barrier between the fire box and the smoker’s racks. It’s really hard to dry out a piece of meat on one of these smokers since water pan smokers provide so much moisture within the smoker. Flavor is added as the liquid in the pan steams and combines with the smoke that surrounds the meat. This environment is ideal for creating more flavors by adding fruit juices or beer to their water pans. Outside of flavor enhancement, water pan smokers are also excellent heat regulators. There are no sharp climbs or falls in temperature because the hot liquid shields the direct heat from the meat, and keeps the smoker’s temperature steady. If you prefer a firm and dry outside on your meat, rather than the mushy outside that wet smokers produce, then the dry heat smoker is perfect. Dry Heat Smokers are also much easier to get to cooking temperatures because it takes last time for the coals and wood to heat up the cooking chamber. Without water that has to be heated, it’s possible to start cooking faster. Higher cooking temperatures are also easily achieved with this method speeding up cooking times. Unlike wet smoking, clean up is much easier because there is no greasy water to deal with. As previously stated, the key to barbeque smokers is low heat over a considerably longer period of time. (Than grilling) After hours of slow cooking, the meat absorbs the smoky aroma that is the trademark, lip smacking taste that is unique to smoke cooking. The very first step, just as with regular barbeque, is preparation of the meat. Your meat can be marinated over night or just hours before with wet or dry rub, brine, or your own special marinade. Selecting the right wood chips for the flavor that you want is just as important as how you prepare your meat. Bad chips can completely ruin the flavor of meat, so purchase your chips from a supplier who carries wood chips specifically for smokers. Meat is Ready and I Have the Wood Chips…What Now?" Now it’s time to light your fire!! Light the charcoals and let the fire burn down just as you would a regular grill. Carefully add your chosen wood chips that were previously soaked in water for thirty minutes. Unlike the normal 400 degree plus temperature in normal grilling, the best smoking temperature is usually 225 to 250 degrees. Stabilize the temperature to within this range using the vents on your smoker. If you’re using a water smoker add hot water to the water pan as well as any other herbs and spices for added flavor during cooking. Once the smoker reaches the desired temperature and has begun to fill with smoke, it is time to add your meat, poultry, or fish. Place your meat in the rack in the center of the smoker for a regular smoker and over the water pan if using a water smoker. How Do I Determine My Cooking Time? Cooking time can vary drastically depending upon the temperature in which you cook your meat and the desired texture when it is done. A typical guideline is 1½ to 2 hours of smoking time for every pound of roast, pulled pork, or any other meat, and about 6 hours for a rack ribs. You will probably need to add charcoal and wood if smoking more than 4 hours to make sure the temperature stays in the 225 to 250 degrees range. 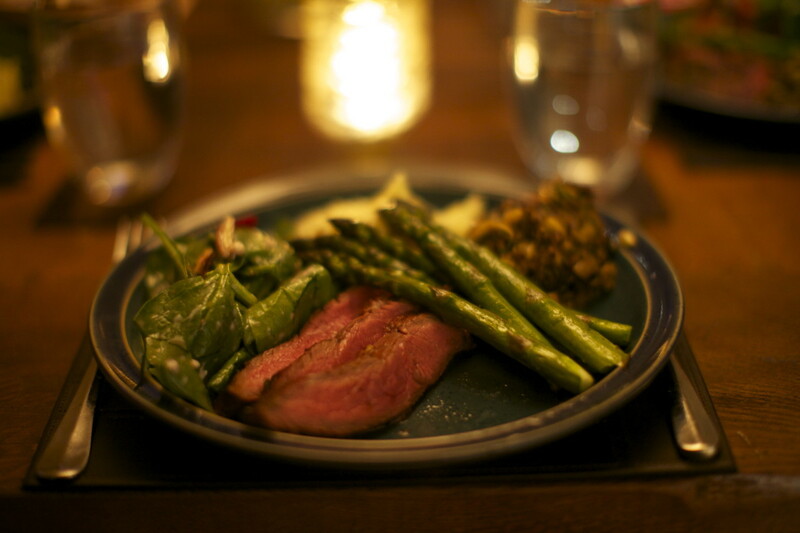 Since temperatures are much lower and the meat is further away from the heat source, flare-ups are not likely. Frequently opening the smoker door allows heat to escape and thus extends the cooking time. You will never need to turn the meat more than one to two times during the cooking cycle, approximately every 2 to 3 hours. Are There other Types of Smokers? There are a few other types of smokers beside the ones previously mentioned. All are effective and is dependent upon user preference. Here are just a few of the most popular types with brief descriptions. One of the attractions of these smokers is being able to adjust the smoking temperature with just the turn of a knob. Having no wood or charcoal to maintain during cooking or to clean-up afterwards is an important convenience as well as the push-button ignition of the flame. A natural gas smoker is a great idea if you’re considering putting together an outdoor kitchen or a grill island. These grills are usually covered with a built in box or drawer to add wood chips for smoking. Natural gas burns so much cleaner than propane, with less chance of affecting the taste of your smoking meats. Wood burning pit smokers isolate the fire from the smoking meat by using a dual-chamber design. The firebox is mounted on the side of and just below the meat-smoking chamber. The smoking chamber can be aligned either horizontally or vertically. 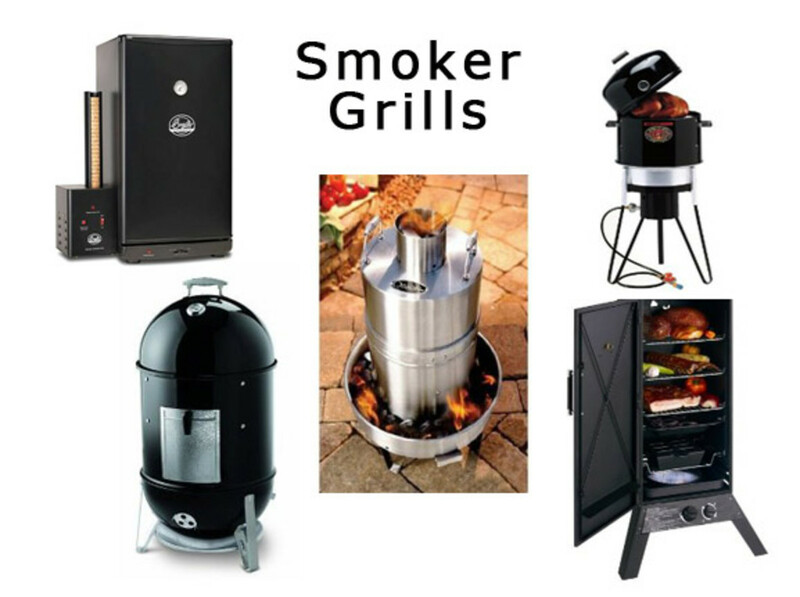 For a novice giving meat smoking a first try, one of these smokers is the least expensive way to become a pit master. As for excellent flavor, cooking over charcoal is unbeatable. There are several styles electric smokers with each having its own unique features. Operation is as easy as turning it on, setting the temperature, and adding the food. And What About the Wood Chips? Smoking has been a way to add flavor foods since ancient times. In fact, in those times smoking was used to preserve meat for long periods of time. These days we use it to enhance the flavor of meats. It’s not necessary to use prepackaged wood chips to add a little smoke to your fire, but you do want to make sure that what you're using the right wood. Different woods leave different flavors and should be hard and free of resins. Some wood make better smoke than others. If the tree bears fruit or nuts you would eat then the wood is normally good for smoking. Woods like Apple have a mellow flavor and if you’re cooking for a while it has time to add that mellow flavor without overshadowing the taste of the food. Strong woods like mesquite give you a good flavor but will become bitter fast so don't use too much or for too long. Smoker cooking is a fantastic way to create great tasting foods. As smoking some meats may take all day, the backyard meat smoker becomes the gathering place and the center of family and social activities. So grab a libation, turn off your phone, pull up a chair, and let’s get "started". I am sorry -- for sure you are a warrior for truth. Actually in my area a warrior could not name himself. So I here you loud and clear, and I admire your braveness quality of you you are. A warrior is not quiet while being one. Maybe when getting ready. How does a hub rank a thumbs up with beautiful, awesome, interesting and useful? It is written by Bravewarrior.